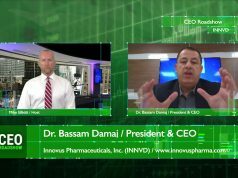 In this episode of CEO Roadshow, we’re joined by Mr. Thomas Equels, CEO of Hemispherx Biopharma, an immuno-pharma R&D and emerging commercial growth company focused on unmet medical needs in immunology. Please see the following press release regarding the collaboration with Roswell Park Cancer Center and Keytruda. Hemispherx is an advanced specialty pharmaceutical company engaged in the clinical development of new drug entities for treatment of seriously debilitating disorders. Hi I’m Mike Elliott and you’re watching CEORoadshow. Today we’re joined by Mr. Thomas Equels, CEO of Hemispherx BioPharma, an immuno pharma R&D and emerging commercial growth company focused on unmet medical needs in immunology. They trader under the ticker HEB. Good afternoon Tom. It’s great to have you back on the show. Tom: Thank you very much, Mike. It’s a pleasure to be here. Mike: There’s been a lot going on with Hemispherx since we spoke a couple of months ago. And the company is now focusing its efforts on Ampligen’s potential in immuno-oncology. The total immuno-oncology market will be worth approximately $14 billion dollars this year, rising to about #34 billion dollars by 2024 as the treatment of cancer patients undergoes drastic changes over the next decade. What can you tell us about the progress made last year and what are your goals for 2019? Tom: Well, as we announced last year we have a number of different initiatives in immuno-oncology that we’re directing our efforts to. And these initiatives are principally related to taking our prior clinical experiences with Ampligen in oncology as a sole agent and animal experiments demonstrating that there’s a dramatic potential for utilizing Ampligen in combination with Checkpoint Blockade therapies to create a substantially more effective synergistic type response for these checkpoint blockade type therapies. And that’s what our focus was placed on a little over a year ago and we’ve been moving very aggressively with our clinical programs tied to that general objective. Specifically, we’ve moved from the animal experiments and human tumor ex-plants further demonstrating the proof of concept into two clinical trials that are well underway, one at the University of Pittsburgh in Ovarian Cancer, one at Roswell Park Comprehensive Cancer Institute in Colorectal Cancer. We have one clinical trial at Roswell Park in Metastatic Triple Negative Breast Cancer which involves Merck’s drug Keytruda and that is commencing any day now. And we have on the immediate horizon a clinical trial, and this is something that I’m very very excited about, in Ovarian Cancer that’s a follow up to the one that’s ongoing at the University of Pittsburgh. We’ve established that Ampligen is well tolerated intraparatenially and we’re moving forward with a 45 subject clinical trial combining Ampligen in Recurrent Ovarian Cancer with Merck’s drug Keytruda. And that trial is being sponsored by the University of Pittsburgh and all of the expenses of that major trial are being undertaken through the collaboration of Merck with the University of Pittsburgh. Hemispherx primary obligation is to supply the Ampligen. Now in order to move these clinical trials forward, we have manufactured 16,000 vials of Ampligen. That’s one of our major accomplishments in 2018. So we have the Ampligen that we need to engage in these major clinical undertakings and I’m deeply grateful that the four clinical trials that are either underway or scheduled to commence in the immediate future are being subsidized by either pharma or University resources so that Hemispherx’s obligation is principally related to the supplying of the Ampligen for the clinical trials. That shows excitement on the part of these collaborators that equals our own excitement about the potential for Ampligen in Immuno-oncology. Mike: Tom, why is immuno-oncology becoming such an important tool for modern medicine? Tom: Well immuno-oncology as a therapy in lethal malignancies is critical because not everybody is able to have a favorable response to surgery or chemotherapy. And sometimes the chemotherapeutic options are extremely toxic and not well tolerated by the patient. Immuno-oncology captures the concept of turning on the human immune system to battle these tumors in a natural way. So once you unlock the key so that the immune system can focus on the tumors you know we often see dramatic results in terms of remission and progression-free survival…without the high levels of toxicity associated with chemotherapy. So it is my belief that the shape of things to come in oncology is immuno-oncology especially in those instances where you have recurrent malignancies or malignancies such as pancreatic cancer for which there is no real viable therapeutic alternative. Mike: And can you tell us more about what Ampligen’s role may be in pancreatic cancer? Tom: Well we are extremely excited about our opportunity to play a role in pancreatic cancer. Pancreatic cancer is one of the most lethal malignancies that’s out there right now. You know, between the United States and Europe, next year it’s estimated that over a hundred and fifty thousand people will die from pancreatic cancer. And the reason for that is the survival rate given the current therapeutic options is only at most seven percent over a five year period. So a diagnosis of pancreatic cancer is in effect a death sentence. And in a way, it’s very short term because this can be a very aggressive cancer in terms of the timing and its rapid progression. Pancreatic cancer tumors are especially sensitive to the immune environment. If a patient is immune deficient cancer tends to be much more aggressive, much more fast acting. Pancreatic cancers … these tumors are such typical cold tumors. One of the things that commend Ampligen in this combination therapy with Checkpoint Blockade drugs is that all of the research to date including…this is detailed in many peer-reviewed articles…you know Ampligen can convert the microenvironment of a tumor from cold to hot. Now, you know what that means is that if we can convert these pancreatic cancer tumors into a hot tumor we give the immune system a chance to work and resolve cancer in and of itself but also we may open up opportunities for checkpoint blockade therapies which are currently not effective in pancreatic cancer. Now, what we have is that the government of Holland of the Netherlands, has allowed us to open up and we’ve been running this for a year and a half now, and early access program in pancreatic cancer where Ampligen is a sole therapy in pancreatic cancer. And that program has been extended and this is a program where we’re treating late-stage pancreatic cancer patients. And I’m happy to say that’s been going well and we’re hoping to gather the data from the total program at some time over the next six months. But what we have gathered is the immunological data from that program. And the initial results stimulated us to then go work with the Buffet Cancer Center at the University of Nebraska where under the supervision of Dr. Hollingsworth, one of the top pancreatic cancer researchers in the world, we began a series of experiments you know in animals which suggested that Ampligen in combination with checkpoint blockade therapies could lead to dramatic synergies in terms of survival and we are working towards creating a clinical trial in pancreatic cancer that will test that in humans. We have every hope because we see similar results in a variety of solid tumors, you know that we’ll be able to make a difference in pancreatic cancer, that’s what we’re working for. We’re working to save people’s lives and create long term value for our stockholders. Mike: Tom, that’s all the questions we had for today. Is there anything else you would like investors to know right now? Tom: Well you know the last time you interviewed me you know I’m going to say almost the same thing that I said then. You know at team Hemispherx, we are working hard to create stockholder value, long term stockholder value by effectively executing on these important goals that I just outlined. You know, there is no hotter topic out there right now than immuno-oncology and we are deep into it in a sweet spot that we intend to play out and make, if at all possible, we are work for a dramatic success at Hemispherx in these fields. Well Tom, it’s certainly a great turn- around the story. The last 12 months have seen a number of significant new milestones for Hemispherx. Thanks again for your time and it was a pleasure having you on the show. We’re going to continue to follow the story closely and we hope to have you on the show again soon for another update. Tom: Well thank you very much for your interest, Mike. I really appreciate it. Mike: Thanks Tom, take care. 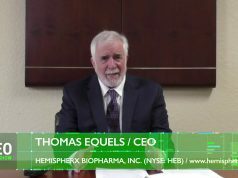 Mike: You’ve been watching CEO Roadshow and we’ve been talking to Mr. Thomas Equels, CEO of Hemispherx Biopharma which trades on the New York Stock Exchange under ticker HEB. Hemispherx is an immuno-pharma R&D and emerging commercial growth company focused on unmet medical needs in immunology. To learn more about them please visit their website at www.hemispherx.net. 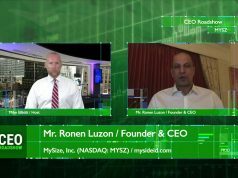 Thanks for watching CEO Roadshow.